At Guaranteed Plumbing, our highly skilled professionals are dedicated to ensuring that local Youngsville, NC property owners have the most reliable and efficient plumbing systems possible. In every project we undertake, our main goal is to provide the highest quality services in order to ensure that our customers are completely satisfied. We have developed a reputation for excellence by achieving this goal each and every time. Our Youngsville plumbers are professionally trained and licensed. As such, you can rest assured that we will satisfy all your plumbing needs and goals in the most effective fashion possible. We are adept at all manners of plumbing installations, renovations, and repairs. Our experts would be excited to assist you with any and all of your plumbing projects. Call Guaranteed Plumbing today if you need to hire a professionally licensed plumber or well pump contractor in Youngsville. Our courteous and polite staff would be happy to assist you in any way that we can. Our knowledgeable experts can answer any questions that you may have about your plumbing system or our expertly performed services. We would be excited to schedule your appointment today. Installing or repairing a Youngsville well pump is an important and difficult task. Whenever you are considering a project that involves a well pump, it is important for youto hire a professionally licensed contractor for the job. In Youngsville, the most proficient well pump contractors are at Guaranteed Plumbing. If you need to install a well pump in Youngsville, you should call our experts today. Our well pump contractors will inspect your property in order to provide you with the system that will satisfy all of your needs in the most efficient and effective fashion. With our help, you are guaranteed to be most satisfied with your well pump for the longest time possible. Afterwards, our Youngsville professionals will always be available to conduct well pump maintenance and repair for you. 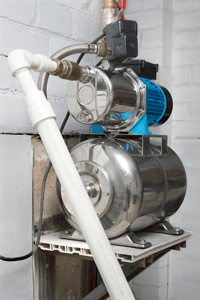 We have the skill to troubleshoot and repair any well pump system. If you need to hire a professionally licensed plumber or well pump contractor in Youngsville, call Guaranteed plumbing at 919-758-6237, or fill out our online request form. "I have had plumbing problems with this bathroom sink for a couple of months. I decided to have [...]"
"These two fellas did a fine job and I will be calling them again for any plumbing needs [...]"
"My drains were backing up terrible so I went on line to see find a plumber, I called [...]"